This is not a comprehensive list of Dang and Kua, as the movements of the pelvis in terms of range of motion of hip joints, sacrum, knees, and ankles are very complex. There should be other references to Dang and Kua. These images match my understanding of the dang. •	Turning of the waist from left to right and shifting of weights in the legs rely on kua being relaxed and loose. •	When the kua is relaxed, the weight burden on legs increases. If legs are not strong enough, the kua will tighten. As a result, knee extend over the toes, abdominals and chest stick out, and the body leaning backwards. •	Relaxed kua + smooth turning of waist = smooth weight transferring. From this, upper body is able to realize lightness or solidity. •	The shape of the legs when in a stance. 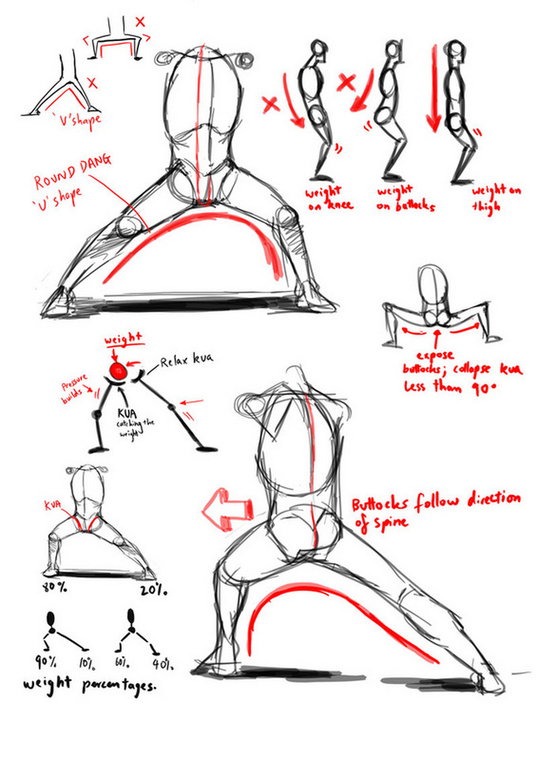 •	The overall look of the stance (from pelvis downward) should be like an up-side-down ‘U’ and not like a ‘V’ shape. •	Muscles in the inner thigh have the feeling of slightly pushing outward. •	The dang should be light, flexible and relaxed. •	Collapsing dang: when buttocks drop below level of knees. •	The angle of bent legs should not be less than 90 degrees. •	Keeping the dang rounded and opened increases strength in the legs. Last edited by marvin8 on Thu Feb 07, 2019 12:28 pm, edited 1 time in total. I was going to ask the same thing. - Why do I need to train this? - How can this improve my fighting skill? - How can this improve my health? I guess the older generation don't really have to train Dang and Kua as they use 'squat toilet' for #2.
johnwang wrote: I was going to ask the same thing. 2. By getting more stability. Helps with both grappling and striking. 3. By training the stabilizer muscles not much engaged in everyday life. There are less-proven effects akin to improving the work of the endocrine system, but I don't have much evidence to back it up. The importance is for avoiding the “butting cow” (顶牛 ding niu) error (using primarily horizontal force) that is often witnessed especially in things like push-hands. The rounded groin instead produces a more vertical force into the legs, like an architectural arch that directs forces down into the support columns (the lower legs) rather than outwards. Vertical force aligns with gravity and favors what we naturally practice every time we stand up. We habitually respond to forces in front of us by pushing back (resisting), or by pulling to our rear. This is, in effect, responding horizontally. We have taught ourselves from childhood to use our weight against resistant objects that we wish to move, which is reflected in the sayings “put your back into it” or “throwing your weight around.” If we push or pull against something that suddenly gives way, we can lose our balance and may fall down. This is the result of acting on forces horizontally. This horizontal approach can be exploited because of the loss of stability when the pressure suddenly changes, and Taijiquan warns against leaning against the opponent. To me it is about favoring vertical forces as opposed to horizontal ones like a butting cow. Not that a butting cow cannot produce powerful force, but that is just training strength against strength rather than optimizing structure (i.e., stacking the structure vertically with gravity). I think that we train to act differently than we act instinctively, and we want to maximize the springs through our legs rather than bracing (and tensing) to act horizontally. Ah ok, thanks, that makes sense. 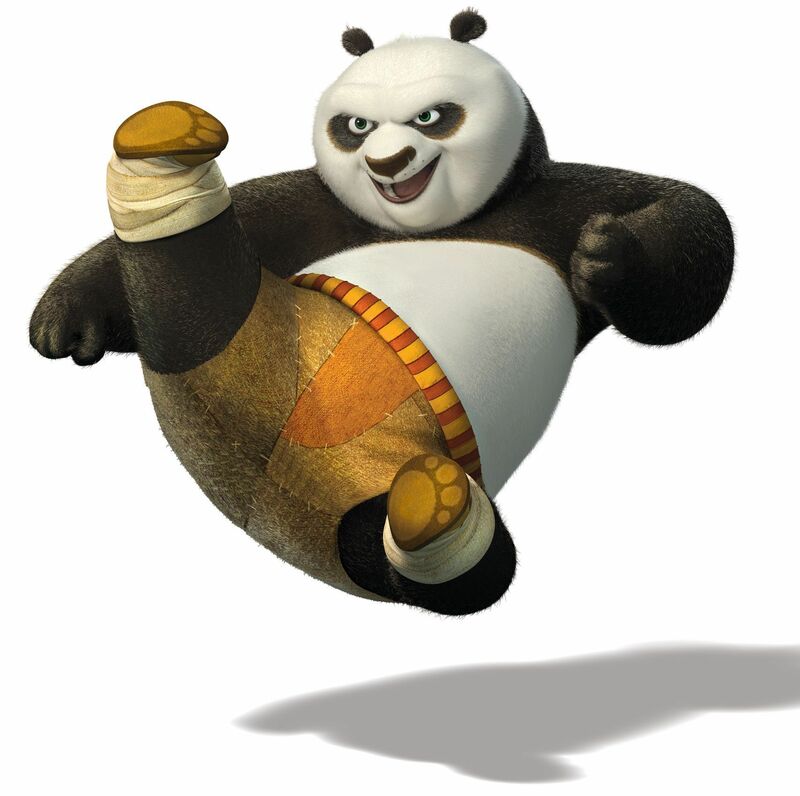 LaoDan wrote: The importance is for avoiding the “butting cow” (顶牛 ding niu) error (using primarily horizontal force) that is often witnessed especially in things like push-hands. 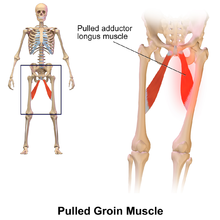 The rounded groin instead produces a more vertical force into the legs, like an architectural arch that directs forces down into the support columns (the lower legs) rather than outwards. Vertical force aligns with gravity and favors what we naturally practice every time we stand up. but I’ve never heard the descriptions you use to describe horizontal force in Taiji. In Yang Style Vertical and Horizontal force is used & also combined. Actually, there are many examples of using horizontal force in Yang Style writings. For instance, Chen Weiming talks about using horizontal motion in applying Ward-off. Yang Chengfu talks about using Horizontally energy to destabilize the opponent. Chengfu wrote: At the same time, take the left hand and lift it up in front of the chest, with the heart of the palm facing in. The elbow drops slightly. Then, using my wrist to attach to the opponents arm between the elbow and wrist, I use horizontal energy (heng jin) to ward off forward and upwardly (peng qu). One must not show a stiff and wooden appearance; then, when the opponents strength has already been shifted by me, his position becomes unstable of its own accord. It's interesting that you view horizontal force as "Strength against strength." LaoDan wrote: To me it is about favoring vertical forces as opposed to horizontal ones like a butting cow. Not that a butting cow cannot produce powerful force, but that is just training strength against strength rather than optimizing structure (i.e., stacking the structure vertically with gravity). I think that we train to act differently than we act instinctively, and we want to maximize the springs through our legs rather than bracing (and tensing) to act horizontally. Horizontal motions are used to neutralize & Stick. Anyway, just a few quick thoughts. Don't know if any of this is helpful for your planned article. Last edited by Trip on Fri Feb 08, 2019 6:53 pm, edited 1 time in total. I need to make it clearer that I am talking about the legs, not the expression of energy in the upper body and arms. Of course you will have the turning of the waist which will translate into horizontal forces and applications. The legs generate power from the ground, and the more vertical this is the less reliant one is on friction, and the more stable and centered one is. The waist gears that power into other planes of motion and the arms finish the expression of energy in any direction. I suspect that most TJQ push-hands players have experimented with PH using a parallel stance (or even a one leg stance). This practices verticality into the legs (if one is not leaning on the partner), even though the interaction with the partner uses horizontal forces. The force against force is related to the butting cow image, where the force in the horizontally driving legs pushes the mass forward horizontally and loses the verticality into the legs or the “root” (loses central equilibrium). The tree image rooting into the ground is vertically aligned with gravity; it is strong horizontal winds/forces that topple the tree (breaks the verticality). In TJQ there is often talk about the verticality of the spine or the “stacking” of the body (or not leaning...) but there is less talk connecting this with the verticality into the lower legs (thus the reason for the pending article). LaoDan wrote: In TJQ there is often talk about the verticality of the spine or the “stacking” of the body (or not leaning...) but there is less talk connecting this with the verticality into the lower legs (thus the reason for the pending article). I think that will be a very good topic of discussion. I look forward to reading the article. I need to make it clearer that I am talking about the legs, not the expression of energy in the upper body and arms. Of course you will have the turning of the waist which will translate into horizontal forces and applications. Ah, I think I see! We habitually respond to forces in front of us by pushing back (resisting), or by pulling to our rear. This is, in effect, responding horizontally. I thought you were talking about a "complete combined process"
and not just isolating 1 part of a process. In TJQ there is often talk about the verticality of the spine or the “stacking” of the body (or not leaning...) but there is less talk connecting this with the verticality into the lower legs (thus the reason for the pending article). Well, then there’s only one thing to say to that. Oh, and sorry for - "Butting in". Last edited by Trip on Tue Feb 12, 2019 4:27 am, edited 2 times in total.